of hurricane Harvey by landing on the passenger seat of a Houston taxi cab was a welcome story of hope. 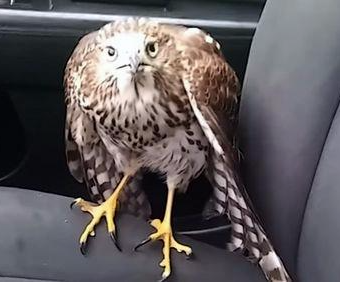 Harvey was rescued by the driver, taken to Texas Wildlife Rehabilitation Center and was later released. His story had a happy ending, but most birds caught in a hurricane are not so fortunate. Fall migration and hurricane season are two extreme events which occur simultaneously. And when hurricanes happen, they have the potential for catastrophic effects on birds. When hurricanes are imminent, some birds and wildlife can sense the impending event through changes in barometric pressure or other cues they can read. Sometimes they have time and opportunity to flee. But their options to remain safe from a rapidly moving overwhelming weather event are often desperate, fairly limited and not always successful. Add to this millions of birds on migration during this time – birds who are already pushing themselves to the limit of endurance during this annual trek to their overwintering grounds. Having to deal with battering hurricane force winds, no food or water for long periods of time, finding shelter or possibly being swept up and relocated hundreds or even thousands of miles from where you were, can be devastating. For an endangered species living where the hurricane makes landfall or which relies on a specific habitat which is destroyed in the hurricane, these storms can be an extinction event. There are amazing stories about some birds like Whimbrels, which have flown directly into and through the eye of a hurricane on more than one occasion and survived. Migrating birds can also maneuver themselves to use the winds on the edge of the hurricane as a tail wind to speed their transit, but this is a dangerous and risky business. There are also many sad accounts, like an entire flock of migrating Chimney Swifts caught in the eye of the hurricane, the survivors relocated to another continent. To find out more about hurricanes and birds, check out this article from Forbes science blogger GrrlScientist which gives as excellent description of what birds face when confronted with a hurricane, what they do and what can happen.